Few discoveries have made the immediate impact that Wilhelm Roentgen’s discovery of X-Rays did in the early 20th-century. Within weeks of his announcement, surgeons were already using X-Rays to find and remove bullets and shrapnel, where they once had to cut a patient open and search through their bodies. (Moreover, these patients had to suffer operations like this without anesthetic, which was invented at around the time X-Rays were discovered.) But while the benefits of X-Rays were immediately apparent, their dangers would not be discovered for another few years. Before it was known that X-Ray radiation was extremely harmful, X-Ray devices were used quite freely. Today, X-Ray technicians protect themselves with lead suits before operating their machinery. 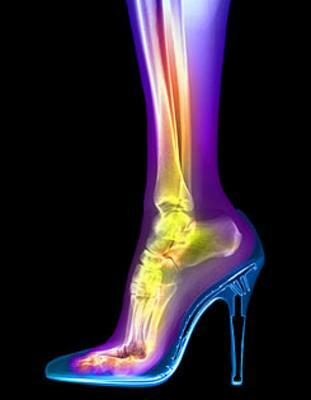 Years ago, X-Rays were used to see how well toes fit into a new pair of shoes. Amusement grounds like New York’s Coney Island included X-Ray exhibits, where children could see the bones in their hands for a penny or a nickel. And X-Ray images were made of a dizzying variety of activities, from jogging to playing the piano. When the dangers of X-Rays were discovered, this playfulness came to an abrupt end. The photographs from that era still exist, though, reminding us just how exciting this discovery once seemed.